My how even the smallest blunders get noticed. Obama's advance team missed a small little nuance this evening, but the social web was watching. The three most visible people directly behind Obama were all wearing Abercrombie & Fitch t-shirts. A&F couldn't have paid for better placement. During the latter part of the Clinton administration, I traveled the country doing advance, essentially event management. The primary focus of advance (other than a happy president) is a good picture (tertiary was a happy press corps). Much of the effort and discussion leading up to an event surrounds the image that cameras will capture. 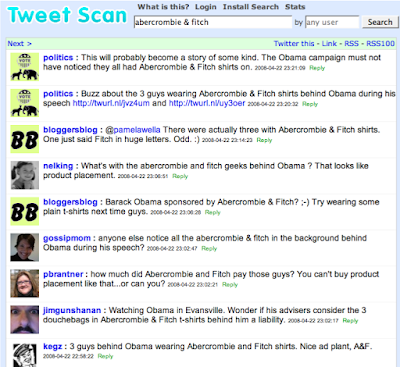 As this search of Tweetscan shows, many folks are talking about it. This guy took a screenshot and posted it on Facebook. Patrick Ruffini sent out a tweet. I Twittered about it as well. Even though I mispelled Abercrombie, I was part of the cacophony. Rather than sulking away, this gaffe reverberated throughout the social web, going far beyond the few picky folks like me that notice such things. What's interesting is that while A/F has generated some buzz, most of it seems to be negative, since the effort seemed to be so obvious.